It never fails, when I am talking with a home seller, they want to try to get a higher price than the comparable homes in the neighborhood are currently selling for. I can't blame them, I want the highest price for them. I understand the reasoning of pricing a bit high in case the buyer offers a lower price. It can be done and successfully, depending on your competition. When there are too many homes available just like yours, you have to be priced accordingly. Of course, there is some room for upgrades and specific amenities, but you don't want to attach too high a price to them. Generally, the hardest hurdle to overcome is the emotional attachment people have to their home. Memories created in a home are what makes it a home. The problem is, the buyer has no sentiment about your home. They are looking at making it their home. They don't care if this was your first home, or whether you personally installed every upgrade. They are comparing your home with every other home with the same square foot in the general area. If they feel the upgrades are worth the cost, they will buy. If not, they will move on to the next home. 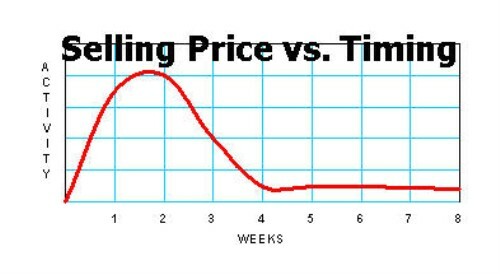 The very best time to get the price right is when you list the home. The graph above indicates the activity a home recieves when it is first listed on the market. The initial activity can not be repeated. The longer your home is on the market - it becomes stale and is subject to a decrease in activity and subsequently, a decrease in price to raise activity to a higher level. Do Increased Commissions Sell Homes? Your analysis is spot-on! Pricing is one of the toughest hurdles we have to overcome when talking with sellers. Everyone wants the highest price possible AND a fast sale. In a buyer's market speed of sale is directly related to strategic pricing. This is not to say that we want to under-price homes to get the job done, we just need to price our listings to be the best in each price class. When sellers understand this concept, everyone wins. Thank you for your post. Brad - Most sellers do not realize they will net the most money when priced competitively from the very beginning. If not, then they need to reconsider selling at this time. It may be in their best interest to wait for the market to come up to their price.